There were two cemeteries, The Mormon Pioneer Cemetery and Forest Lawn Cemetery, close to Florence Elementary School where I attended kindergarten through fifth grade. Since the Pioneer Cemetery was on the way home, if I took the long way, I never spent much time wandering around the Forest Lawn Cemetery, or at least not much past the gates. But tucked away inside is the Josiah and Alma Wasserburger Monument, erected in 1938 and constructed at a staggering cost for its day. Josiah and Alma both died in 1956, 5 days apart and left no record behind revealing who the cloaked figure represents. There is speculation about it. 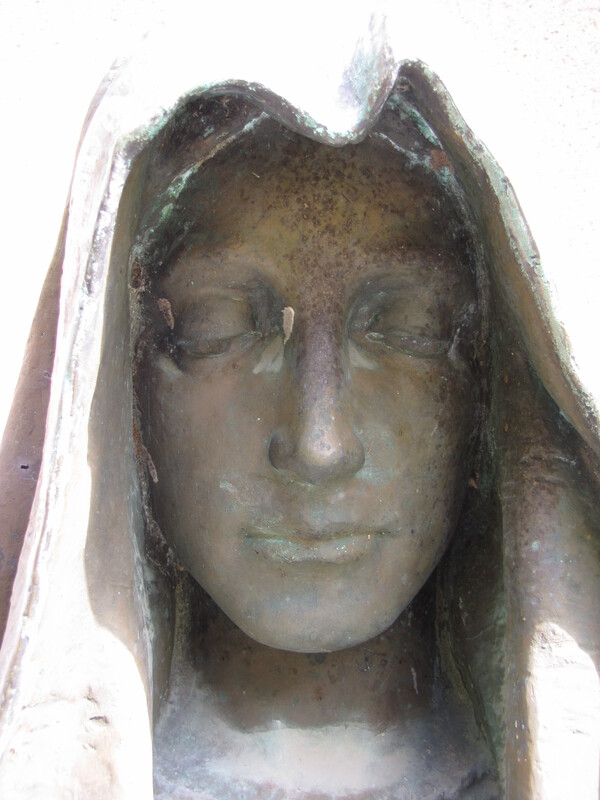 Some think the figure is Christ but closer examination of the seated statue reveals a woman’s face beneath the shroud. The monument yields no clue about the indentity of this female sentinel. The inscription devulges no clues either, but leaves behind a message about the body’s decay but not of the soul’s. This is the kind of monument that give cemeteries a reputation for being scary. I have to admit, even though, I have had an affinity for cemeteries for as long as I can remember, had I spied this as a kid a long about dusk, I would have been creeped out and probably run outta there as fast as I my squat fat legs would have propelled me. My first cousin, Rick, used to unscrew the single bare lightbulb that hung from the ceiling in our attic, lock me in, and then whisper to me through the door that Miss Rat and Tilly Witch were going to eat me. I was terrified. So, I was jumpy as a little kid anyway. Who knows? 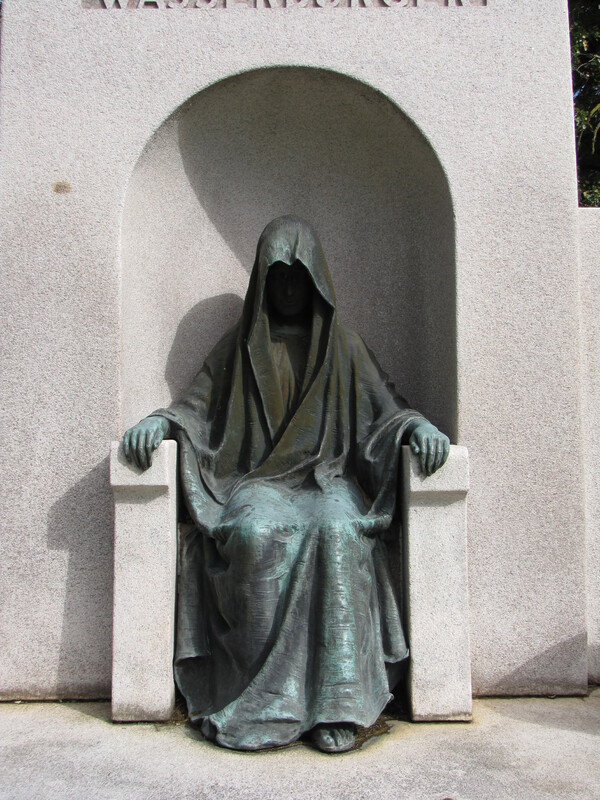 This cloaked mourning figure mightta spooked me away from what has become a passion in my middle age. Okay, well, slightly past middle age. Well past middle age. The face, to me look like those on statues of The Virgin Mary. I would like to use the Cloaked Sentinel images for a school project. Do you have the copy right to these images? If not where can I get them from?